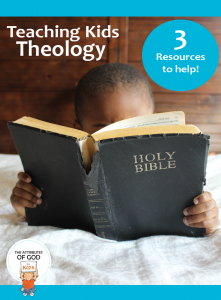 Teaching Kids Theology – 3 Resources to Help! Theology is the study of God and of God’s relation to the world. Of all the things we teach our kids, one of the most valuable (and overlooked) is teaching kids theology – teaching them who God is and what He has done. 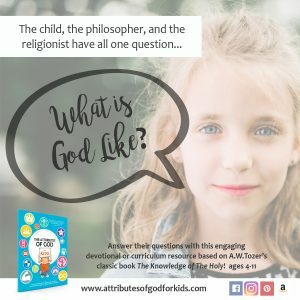 Theology…for kids? Is that even a thing? Theology is for hooded monks with quill pens and professors with shelves of dusty books. It’s for pastors and children’s ministry directors. But theology for kids? Absolutely. Jesus asked His disciples this question: “But what about you?” he asked. “Who do you say I am?” Matthew 16:15 (NIV) Who do your kids say God is? If you paused their tablet right now and asked them “Who is God?”. What would they say? As fun as it sounds, most of us don’t have time to read a thousand-page book on systematic theology. So where is a parent to start? How does one take a topic of such infinite scope and eternal implications down to the level of a child? Start with the basics: Who is God? What has God done? Who has God made you to be? Here are 3 resources to make it easy for you and fun for them! What other resources have you found helpful?